Diseases are just one of the problems of modern humanity. The one that is currently most visible. But while many of them are easily cured by drugs, there is no cure for the rising water level. Water is an element, that can not be stopped or escaped from. And the levels of the world’s oceans are steadily rising as glaciers at the top of our world melt. 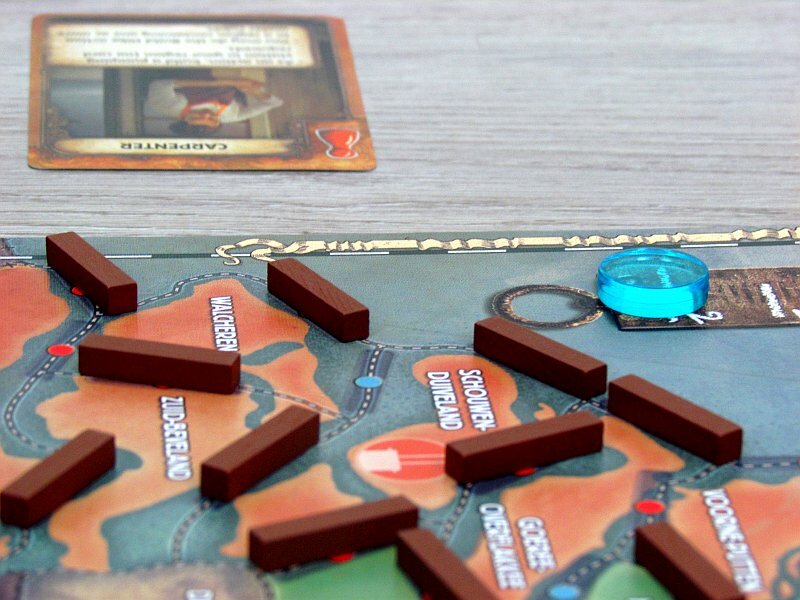 So it has come a time for us to look beyond the classical infection, that spreads through air and touch in classical board game series. Pandemic: Rising Tide belongs to line of games based on the same principle, as we have already tried in versions of Cthulhu and Iberia. Even this time with name Matt Leacock on the box. Jeroen Doumen was his partner in development of this new box. 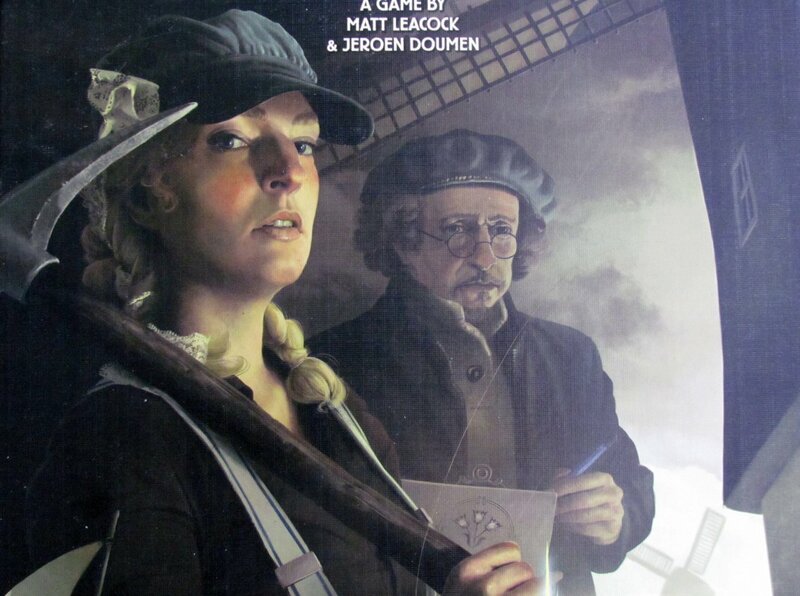 Even the new survival series (Limited Edition) is published by Z-Man Games and Esdevium Games is delivering them to European desks. And theme comes alive through lid of a box. 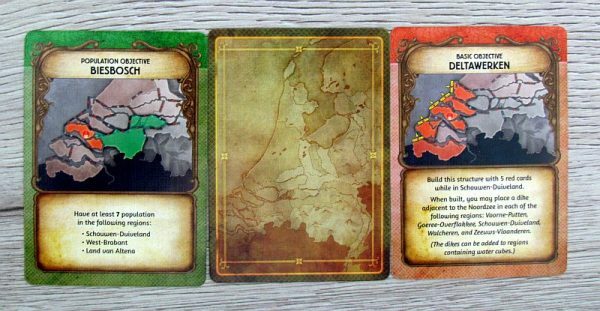 In the picture, we see heroes, who are ready to put their own lives at stake to protect the Dutch territory, with pickaxe or maps. Holland is, where the game takes place, as you will discover for yourself, when you open the box for the first time. Inside, there is a new portrait oriented gameboard, that covers the entire area of Netherlands. There are positions for cards and flood scale telling player, how serious it got. One floor down, in the bottom of the box, players can expect brand new components. There are wooden figures representing huge water pumps, fifty bars of dykes, houses marking ports, water cubes and water tower chips. And of course cards. 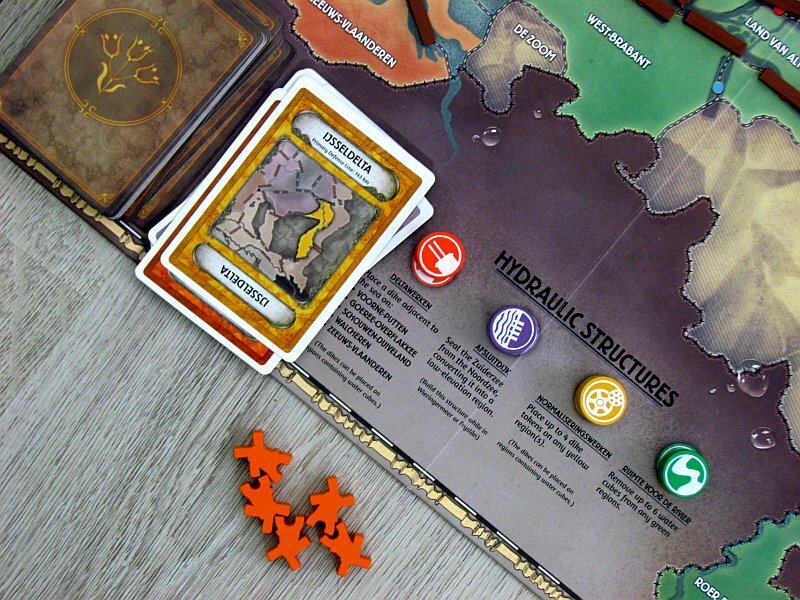 But with setup, we return to the board itself, which players lay on the table and put tokens of water structures on the bottom. They must be bulit by players to prevent disaster. Local residents, however, did not fail at first in the light of the disaster and set up temporary dykes all over the country. With the help of the thin sticks, players will place all fifty brown markers on the spots with red dots. Each of the seas recevies two cubes of water, which means, that only a little water is now flowing on the plains of Netherlands (four are maximum). 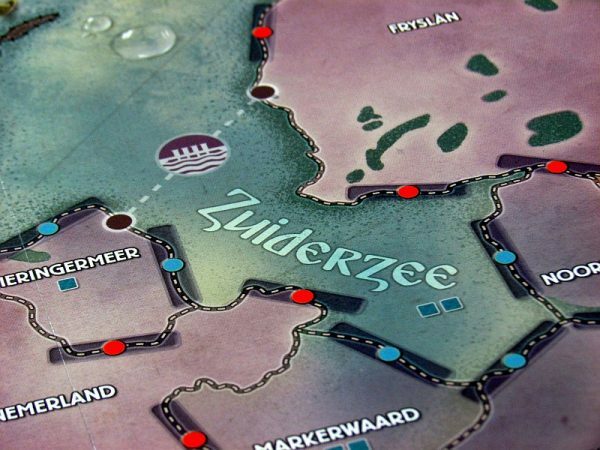 But that will soon change, as water spreads and players during setup put few cubes also on neighboring location at Zuiderzee (sea). These areas are already facing floods. 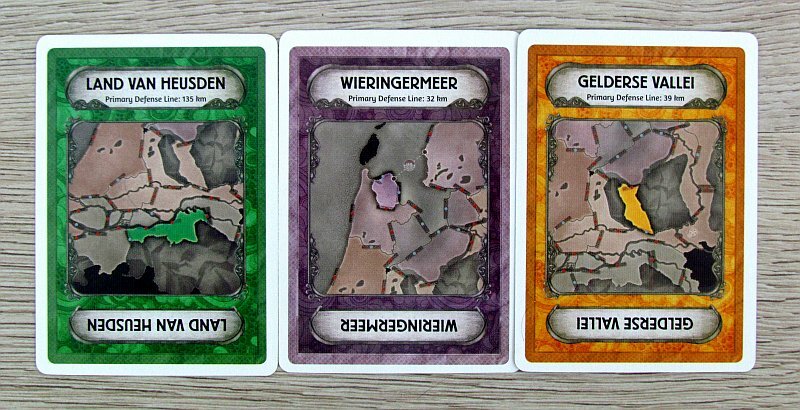 Some of the barriers are not built well, so players have to reveal some dike failure cards and, according to their instructions, remove bars from the corresponding regions. If it is not possible to complete this task completely, because there are no blockages left at the border of the area, player place an extra water cube instead. 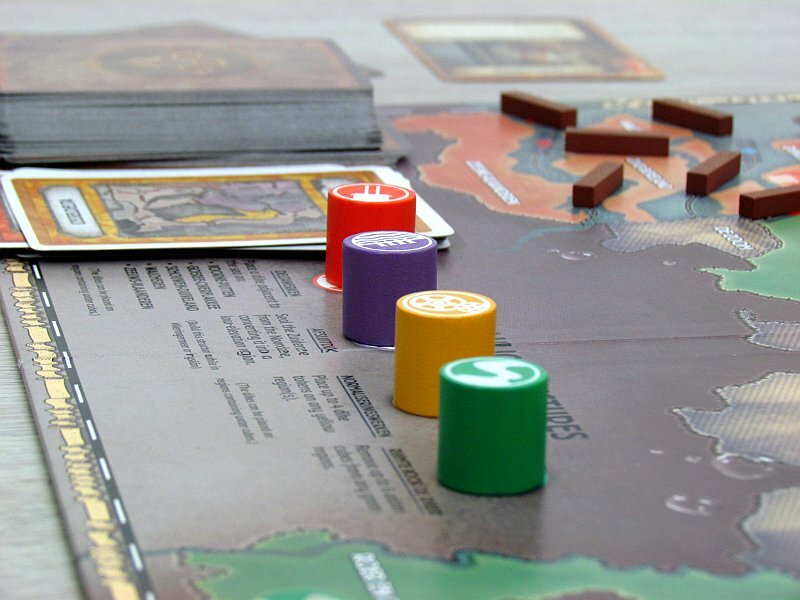 Players use nine cards in total and thus prepares the situation, they will have to deal with. Even before first their work starts, players have to select their own hero, either randomly or by choice, and place matching figure on the Delfland starting location. 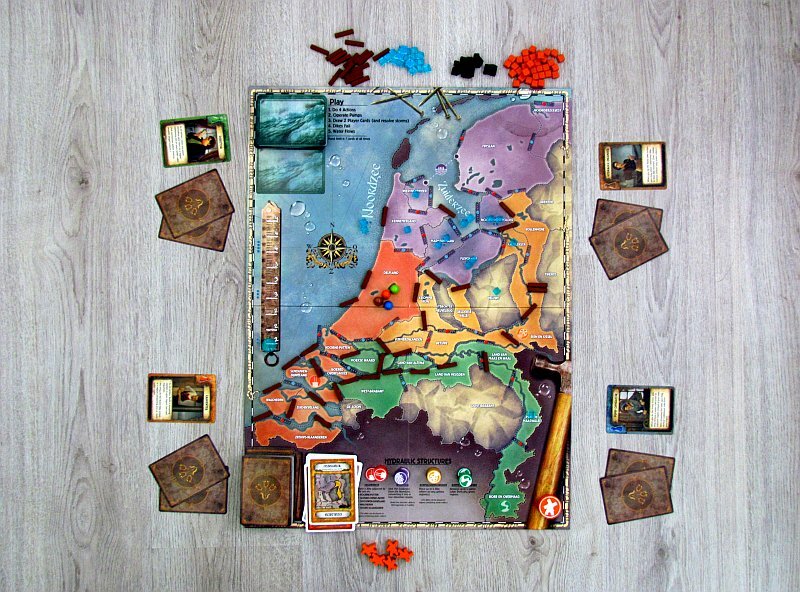 Then all that’s left is to prepare decks – firstly, players shuffle pile of region cards, add events according to number of participants in the game and draw few of them in hand. All teammates will spread their cards openly in front of themselves. 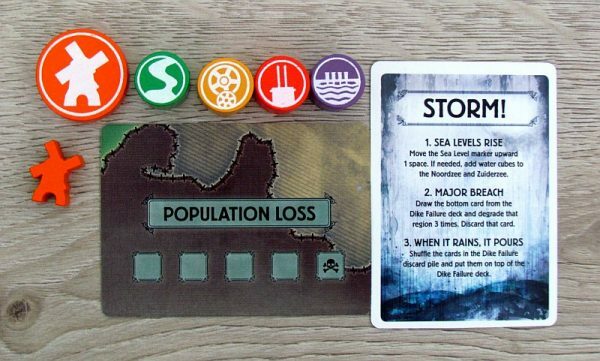 Then it is time to adds six or eight storm cards to that deck (depending on the difficulty chosen), places it on a reserved place on the board, shuffle second pile of failures and place pumping token nearby. Before the game really starts, players must first let the water flow. All the regions, that contain two or three cubes of water, will poor out and flood spreads to their neighboring locations. Here, however, altitude of the locality plays important role and especially built barriers. If there is no dyke, then the water progresses (three water cubes spill into two for every adjacent location, two cubes only one). But we’ll get to that later, because its done after every turn as well. Now it’s time for players to finally make each use of their four actions and try to fight that stubborn element. Within their actions, heroes can move one space on a neighboring location (regardless of altitude), discard a card to move to another city. All movements are happening using boat, because this time there is definitely not a deficiency of water around. 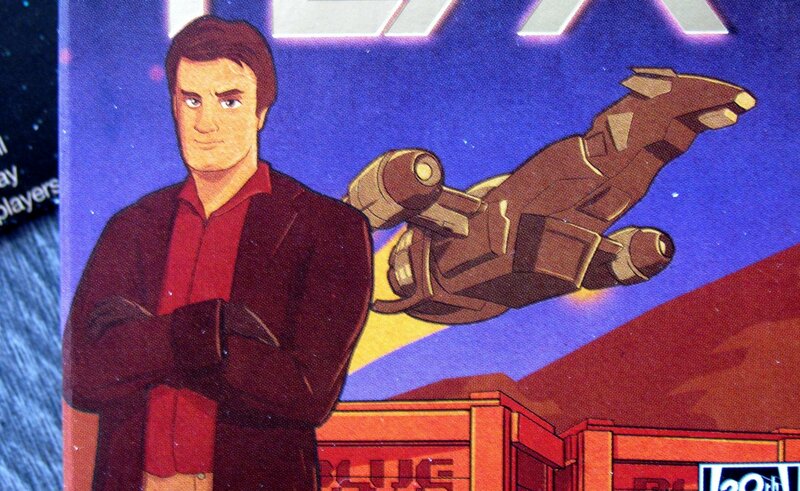 For one action, player can also return to any port location on map. Players can also pass cards to their partners. This ends list of traditional actions known from every usual Pandemic match. The easiest new action to put hero hand’s to work is to pump one of the water cubes from current location. But even if there is no cube in the hero’s place, it is possible to do interesting actions – especially build barriers. Their number is not limited and it is therefore possible to stack one on top of the other. But the water can be swiped back to the sea even more efficiently. Its possible to build a pumping station in the most dangerous locations. 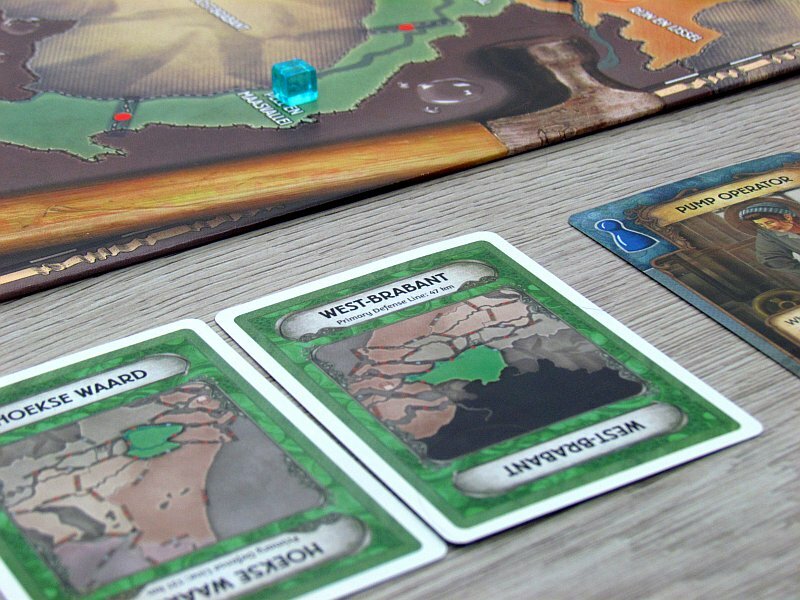 For this purpose, it is necessary to discard a card with the same location name as region, where player wants to build this automatic machine. At the end of each round, such a station drains one cube, not only from its place, but also from the surrounding area, if route can be tracked without a barrier. 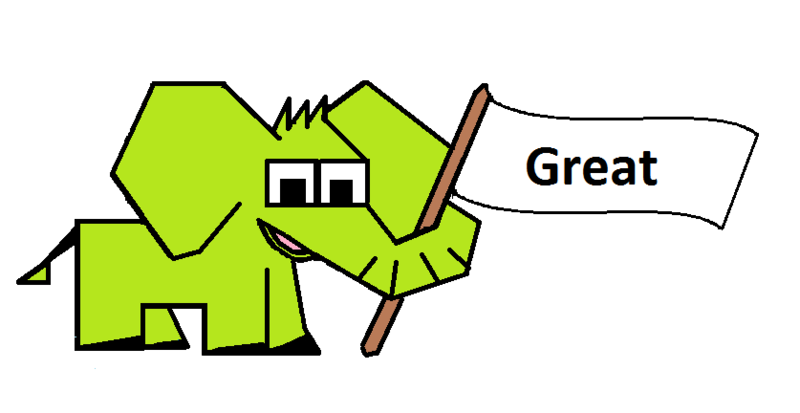 Instead, player can build port in the same way and thus prepare for the possibility to move here anytime in the future. There can be only one port in each region. The last action is the only way to victory. 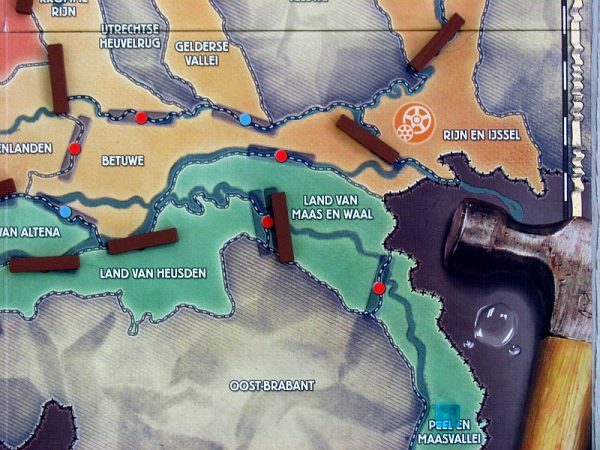 In specific locations on the map, there are silhouettes of water structures. It is here, that one of four key buildings can be built, but players needs to collect and discard a set of five cards of that region (color). After all four actions of one player have been used, another player will get to act until the moment, when everyone had his fight with water. Before storms get chance to hit Europe, players can activate their built pumps. To not forget about it, they can place a reminder token on their player deck. Pumping is possible not only from position, where the machine is built, but also from the surrounding areas. Pumping must not cross any dyke. Then storms may come and water level will rise. Players will turn their attention to the region card bundle and draw two new cards in their hand. Then one of the participants turns two (initial) or more (depending on the level) of the dam failure cards. According to depicted locations, players destroy one of the barriers on border of this region. In the event, that there is no wall available to tear down, heroes must instead add a cube of water. This actions may result in flooding and adding fourth cube of water to the region. This will not happen, but water immediately spreads to neighboring areas. Each unprotected area (without a dike) gets one new cube of water, spreading further, if there are four cubes again. However, water avoids elevated locations in the south-east of the map. Water also flows by itself, moving quietly and inconspicuously across the lowlands. Once this phase has been resolved, locations should all have a descending number of cubes according to their neighborhood. In the region adjacent to sea, there are always at least one cube less, than on see. Next to three cube location, there must always be at least two cubes of water, next to the two dice site, all areas have at least one cube of water. This is a sophisticated simulation of gradual pouring of water on the ground. But it still is not all. 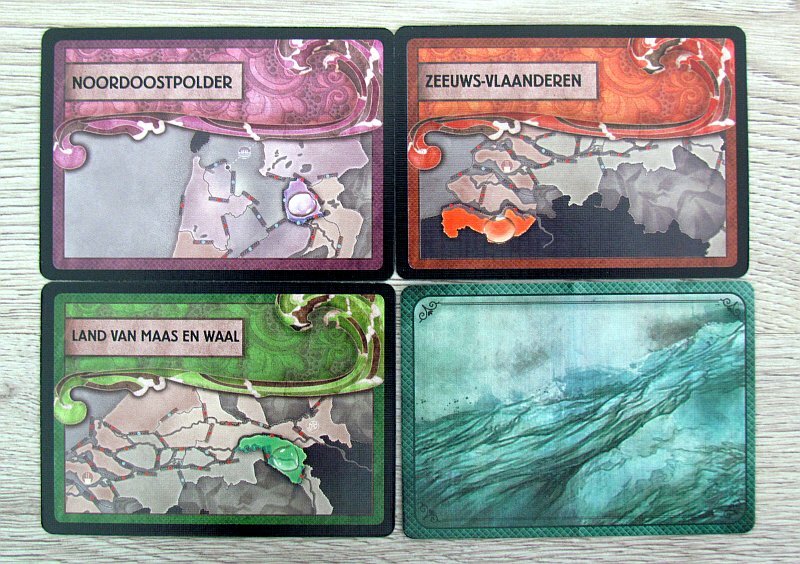 There are a number of storm cards in the player’s deck of the regions, which bring more water with it. 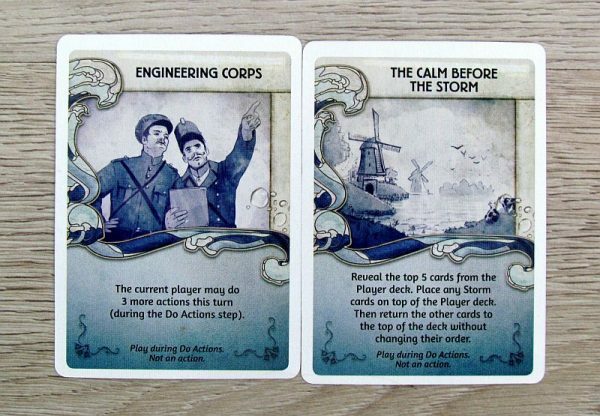 When player draws a thunderstorm card instead of a new location card at the end of his turn (just like with epidemic card in Pademic), he must immediately move flood marker one field upwards. 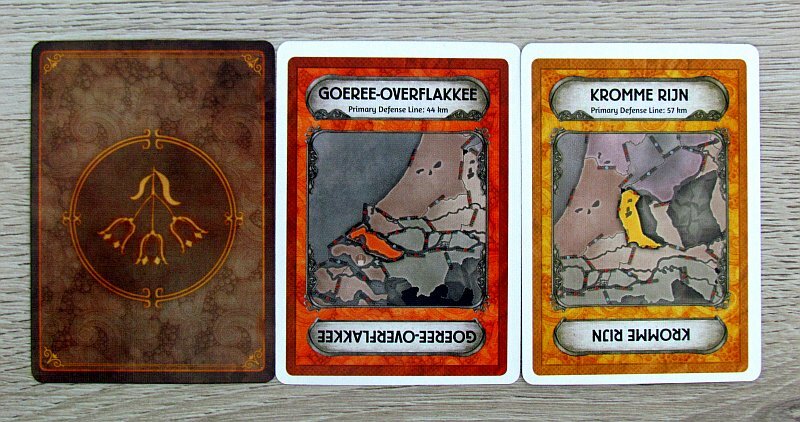 It may happen, that in the following rounds, players will draw not two, but three cards from the dike failure deck. And because the water level is rising, players will add one cube to both seas, that are source of all the water. There may be up to four cubes located in the sea area (only exception). In addition, water will deal a big blow to player defenses. As a result of storm, one card from bottom of dike failure deck has to be revealed and players will remove three barricades from borders of that location. All the cards from discard failure deck are shuffled by players and put back on top of deck. Players are fighting water until there are no more cubes in stock. In such a situation, the team lost and the whole of the Netherlands was underwater (except for a few elevated regions). It can also be lost as a result of a bunch of regions being picked up. Victory can only be celebrated in a situation where players successfully build all four water structures. Wow. Exactly this can surprise you, when you think, you have seen it all. Would you like to see Pandemic reinvented? Try Rising Tide. It is strange, how the game can change completely by changing the environment and several mechanisms. But it may not be such a surprise, just remember the Forgotten Desert, which has also excited us. 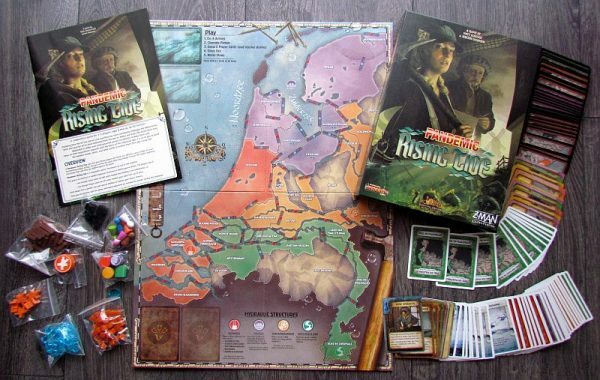 And that’s a bit of a sign of reality – Rising Tide is a great and exciting game! Although the basic mechanisms of water spreading and negative cards shuffled into player’s deck remain, there are new elements. The main and the most striking is the flow of water. Fluid is fighting back somehow without any action needed. 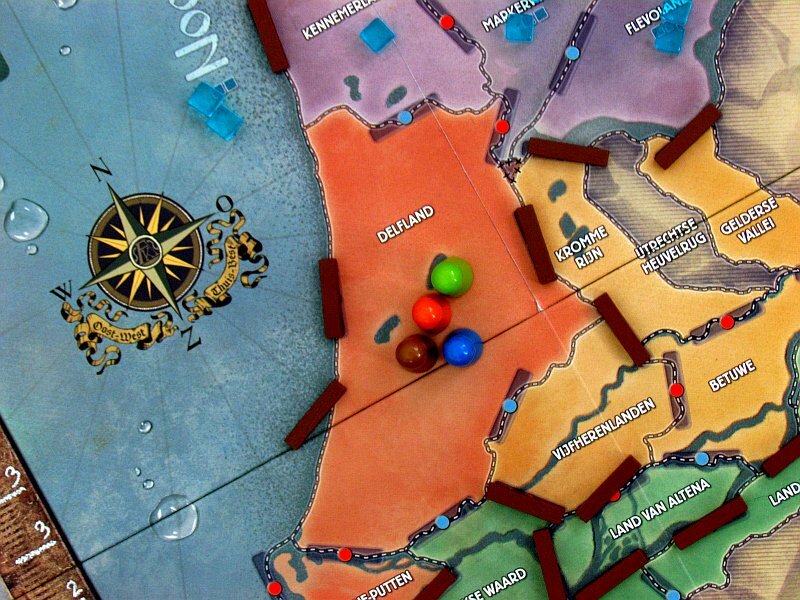 Players must expect, that each level increase in one region will affect all adjacent locations. And right at the end of their turn, which is crazy. Therefore, it is absolutely necessary to eradicate these situations before they happen. 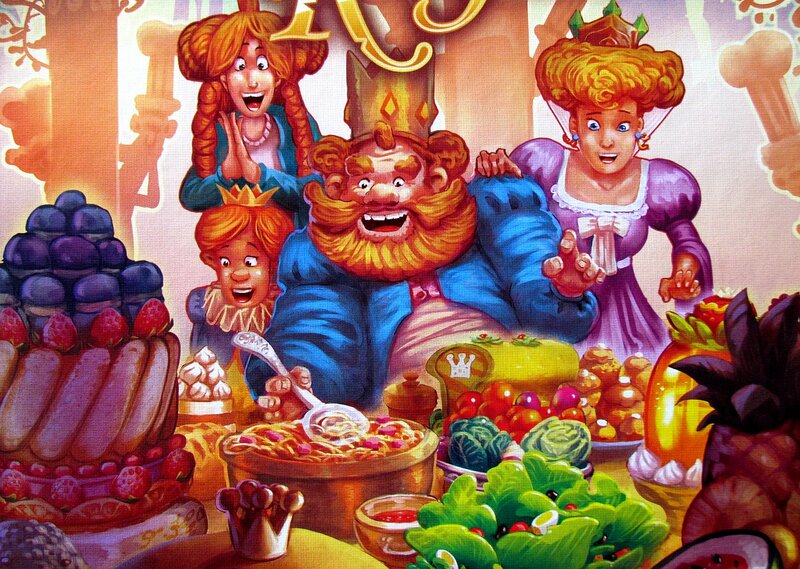 It creates a lot of accounting, which is biggest flaw of the whole game. 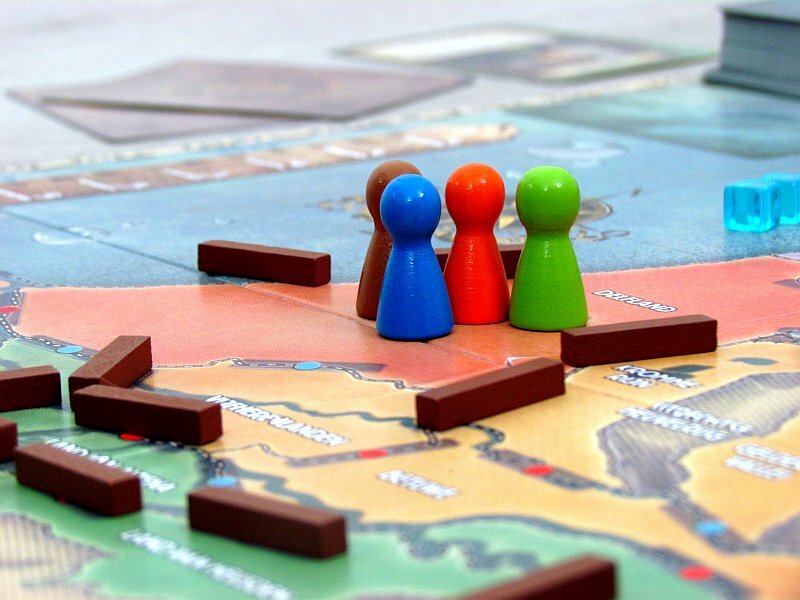 Even Pandemic: Rising Tide, of course, remains a cooperative game in the first place. Players win and lose as a team and have to consult their choices well. Alpha player problem has been discussed and minimized by players themselves. There are a lot of elements on the plan, that have an impact on the process of winning. That’s why more eyes always see more and get more chances to win. Every mistake is dearly punished. Players have two options in their portfolio to deal with one of the elements. In addition to removing cubes with their bare hands, it can even be cleverly automated and rid of the furthest drops of water without action. And then, there are dams to prevent the water from flowing around. Their number is not limited, so the heroes can prepare themselves for some disaster. And they will come! The water simply does not flow in such places, no matter what happens. 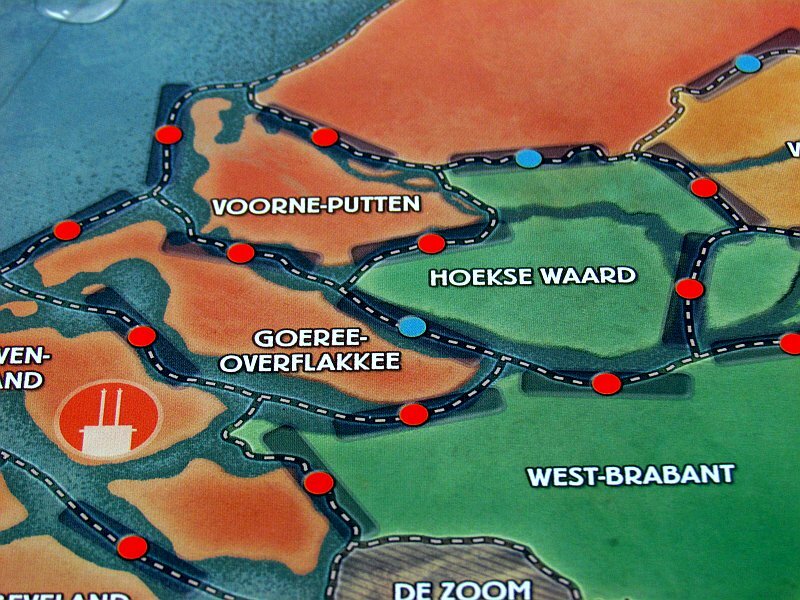 The map cleverly uses areas with low altitude, which makes Dutch perfect country to set this in. Water flow through a seemingly narrow valley on one part of the map, which thematically feels great. 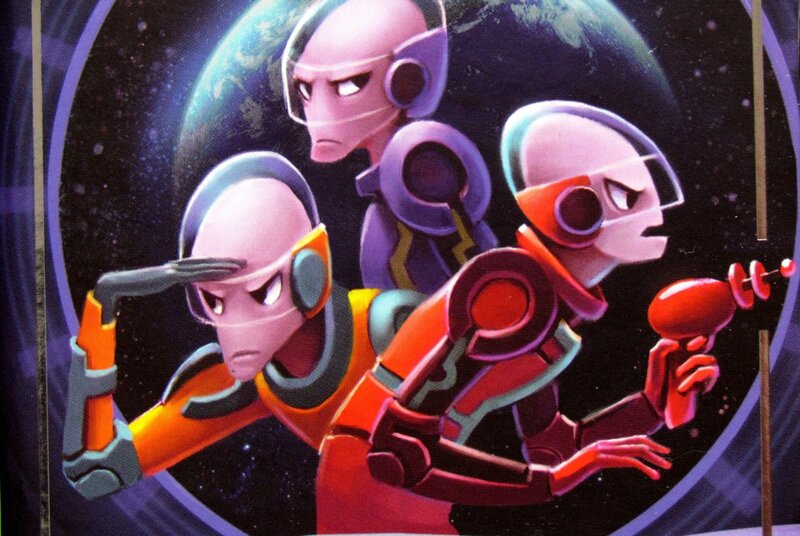 In order for the game not to lose your attention after several games, you would only expect special skills of the characters. But there are also changes in the rules for next level of the game. 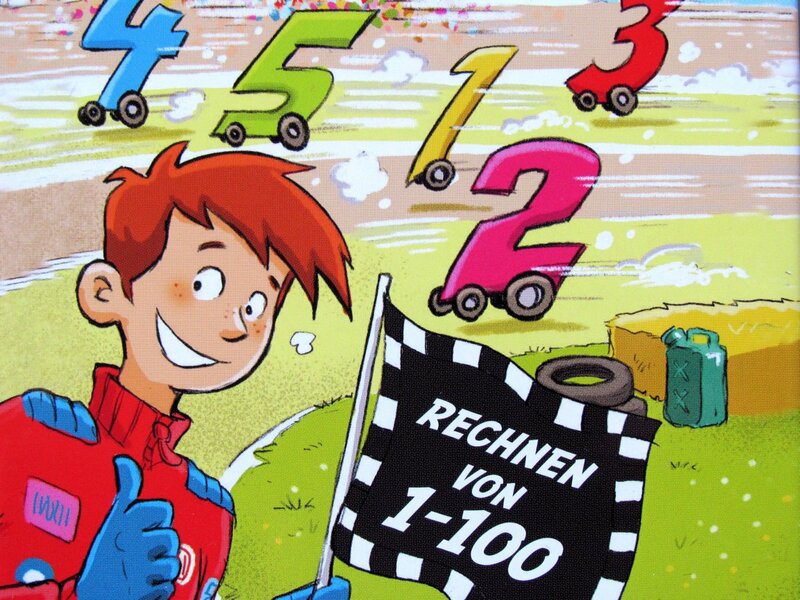 Here, players will use the new task cards – players will always get a combination of four random tasks (from twelve), that they have to complete for success. They can as new action add new population cubes to locations using cards of that region, which then serve as a further condition to lose. 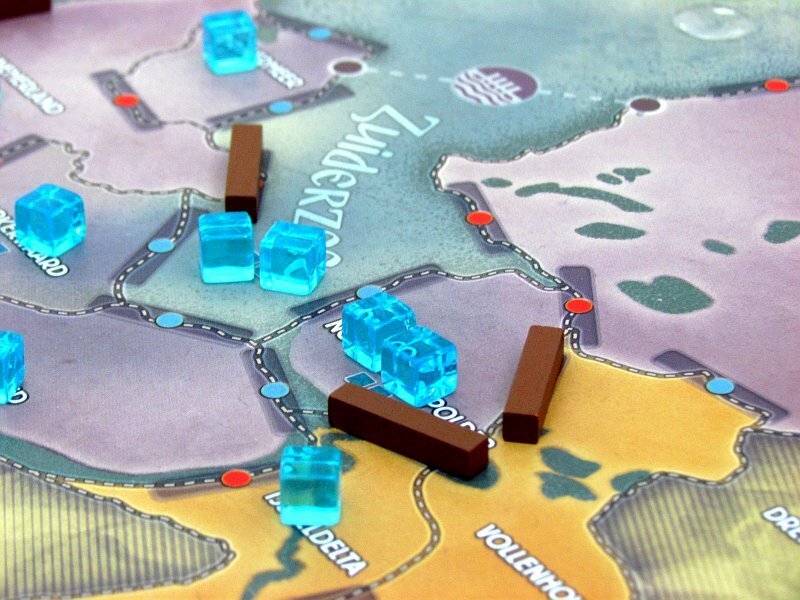 All it takes is, that as a result of floods (at the moment, when number of cubes in the location should be increased over three), five cubes of population are removed and whole effort of the players will be lost. With these additional components, there is also a much better variability in difficulty, offering a total of nine levels. Gradually, they add more tasks to meet in one match and there are also more storms to overcome. Again, however, matches on one difficulty are not quite comparable. Overall success depends largely on luck in cards – whether barriers collapse or players get right region cards. But because, there is a completely new enemy on the map, classic strategy known from the original Pandemic is not enough. Players have to think differently and overall, the game has more difficult feel. It is good, that the game works again in two and even in the new coat does not last more than an hour. 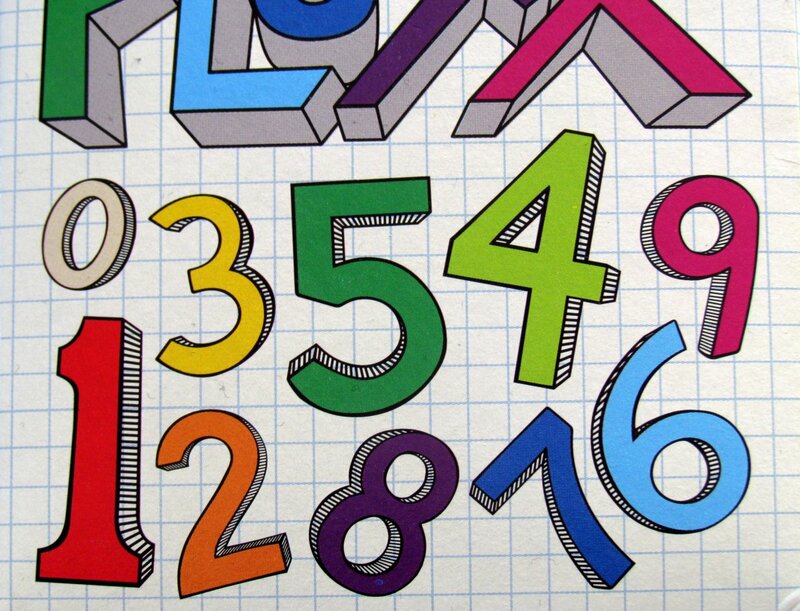 Processing is pretty, wooden, with nice illustrations and colors, so there is nothing bad to say. 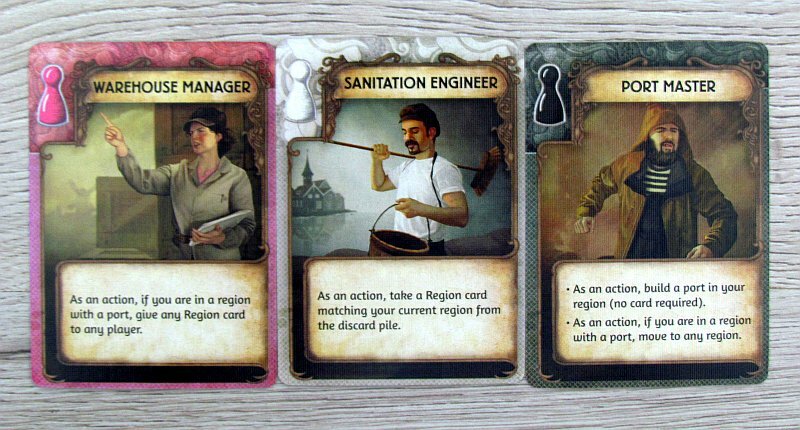 Pandemic: Rising Tide comes with one surprise after another, although you probably did not expect it. This new Pandemic is completely different. No, it will not change opinion of players, who do not like previous installments, because its still a puzzle without a strategy (as they say). But if you ever liked Pandemic mechanism, then Rising Tide is a revival of this and in a totally splendid phason. 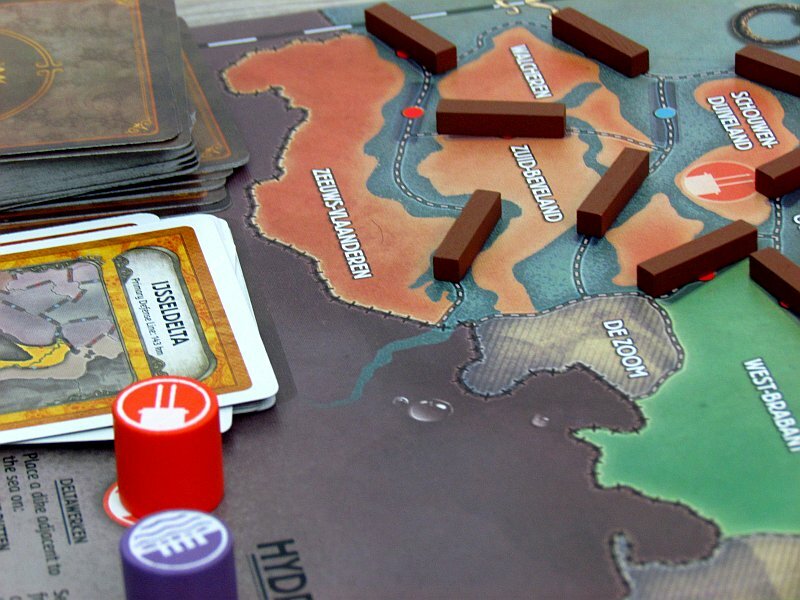 Pandemic: Rising Tide shows exactly how water is truly disobedient element. Just a moment of inattention or one error and it's already flowing, where you did not want it. And getting rid of such floods is not easy at all. Players are running on the board as furious, pumping water, building barriers and hoping the ocean level does not rise too fast. 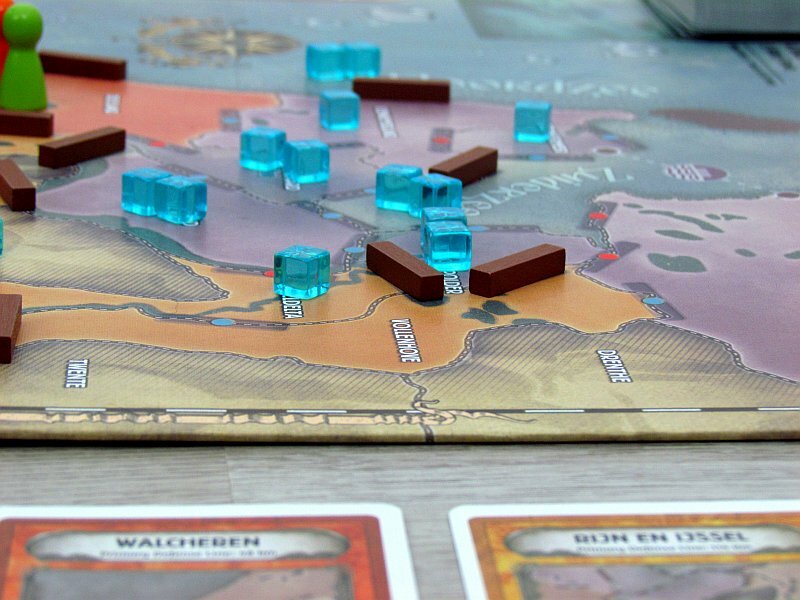 The game stays dependent on good cards, but it offers a great feeling of spreading water on the map. Pandemic: Rising Tide has not only a very original theme, but also excellent gameplay for all, who do not want to participate in the rescue of humanity, but to work on averting it.